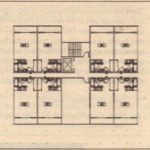 Suppose your client decides your apartment building design needs a few one bedroom units. 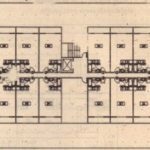 In this exercise, you will use the studio unit drawing as ‘!- basis for the one-bedroom unit. 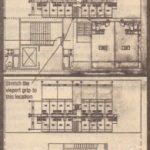 To do so you will double the studio’s size add a bed: room move the kitchenette rearrange and add closets and move the entry doors) In the process of editing this new drawing you will see how you can build on previously drawn objects. 1~ You’ve already saved the current Unit file. 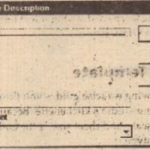 Now use File “.. Save As to save this file under the name of This way, you can use the current file as the basis for the new one-bedroom unit. 3. Move the dimension string at the right of the unit 14′-5″(439an) further to the right and copy the unit the same distance to the right. 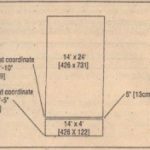 Your drawing should look like Figure 12.8. 4. 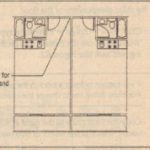 Now erase the bathroom kitchen door closet room labels and wall lines as shown in Figure 12.9. 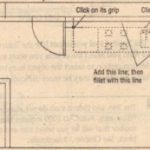 Although you could be more selective in step 4 about the objects you erase and then add line segments where there are gaps in walls this is considered bad form. When editing files it’s wise to keep lines continuous rather than fragmented. Adding line segments increases the size of the drawing database and slows down editing operations. 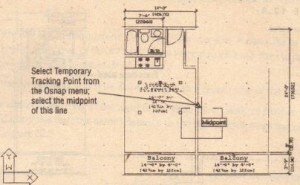 The living room of this one-bedroom unit will be on the right side. You will want to move the Living Room label from the left half to the right half: Normally you would probably just move the label without worrying about accuracy but we’ll use this opportunity to show how the Temporary Tracking Point feature works. 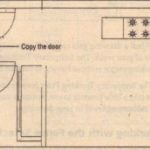 In the next exercise you will place the Living Room label in the center of the living room area. 1. Make sure the OSNAP and POLAR buttons are off in the status bar then click he Living Room label in the unit to the left. 2. 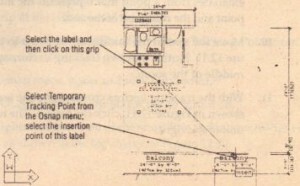 Click thetop-center grip in the label as shown in the first image of Figure 12.10. 3. Shift-eright-click the mouse to open the Osnap menu. 4. 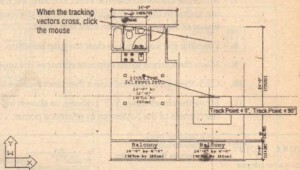 Select Temporary Tracking Point. 5. Shift+right-click again, and then select Insert from the Osnap menu. 6. 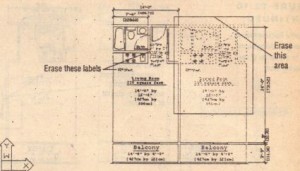 Click the insertion point ofthe Balcony label of the unit to the right as shown in the first image of Figure 12.10. Notice a tracking vector emanating from the selected insertion point as shown in the second image of Figure 12.10. 7. 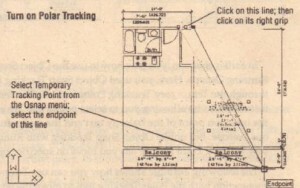 Shift+right-click and select Temporary Tracking Point. 8. Shift+right-click again and select Midpoint. 9. This time, click the midpoint of the vertical wall between the two uriits as shown in the second image of Figure 12.10.Notice that a tracking vector now emanates from a point that represents the intersection of the text insertion point and the midpoint of the wall. 10. Move the text to the middle of the room to the right as shown in Figure 12.11. Notice that two tracking vectors appear and converge in the middle of the room. In earlier chapters you saw howto use the Object Snap Tracking feature with Running Osnaps. Here you used. Object Snap Tracking in a slightly different way through the Temp rary Tracking Point feature. The Temporary Tracking r int feature works by allowing you to select points that are aligned orthogonally like the insertion point of the balcony text and ‘the mid p t of the wall in the previous exercise. But unlike Object Snap Tracking with Running Osnaps the Temporary Tracking Point feature lets you focus on specific object snap points. The following example shows how you can use Temporary Tracking Point in conjunction with the Polar Tracking tool to move the endpoint of a e to align with the endpoint of another line. 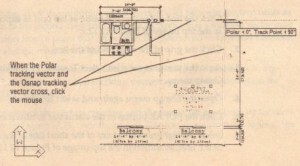 in the top image of Figure 12.12. 2. Click the grip at the right end of the line. 3. As in the previous exercise select Temporary Tracking Point from the Osnap menu. 4. Open the Osnap menu again and select Endpoint. 5. Click the POLAR button in the status’ bar to turn it on. 6. Select the rightmost endpoint of the short line at the bottom-right comer of the unit as shown in the top image of Figure 12.12. 7. Move the cursor so that the Polar Tracking vector crosses the Osnap Tracking vector in the upper-right corner of the drawing, as shown in the bottom image of Figure 12.12 then click that point. 8. Press the Ese key twice to clear the grip selection. 9. 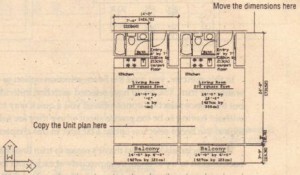 Move the kitchen to the opposite corner of the unit as shown in Figure 12.13. 10. Click the Move tool and select the closetarea as shown in Figure 12.13. 11. 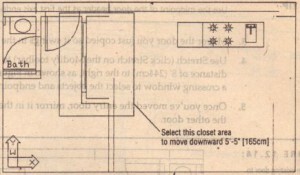 Move the closet down 5′-5″ (165cm), as shown in Figure 12.14. You can use the corners of the bathroom as reference points. When a drawing gets crowded, you may find that Running Osnaps get in the way of your work. The Temporary Tracking Point feature lets you access the Osnap Tracking vector without having to turn on Running Osnaps. The Temporary Tracking Point feature and the other tools that use tracking vectors take a little practice to use but once you understand how they work they are an indispensable aid in your drawing.